Fylde played out their fourth goalless draw of the National League season in Hampshire. Chances were few and far between, and although the Coasters were in control for large parts they couldn’t break down a resolute home defence and have managed to score in only one of their last five games. 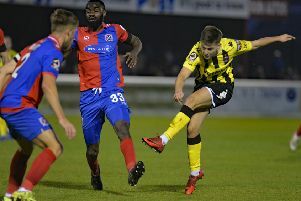 After their first defeat of the season at home to Salford City on Tuesday, manager Dave Challinor made three changes, with Danny Philliskirk,Joe Cardle and Arlen Birch replacing Andy Bond, James Hardy and Zaine Francis Angol, who was on international duty with Antigua and Barbuda. The opening stages saw the Coasters have most of the ball but it was the visitors who had the first meaningful attempt on goal. A poor goal-kick from Jay Lynch was pounced on by the hosts and a ricochet fell kindly for Mark Yeates, but Lynch made amends with an excellent save from the former Blackpool winger’s shot. The first real chance for Fylde came after 18 minutes. Excellent play from Ashley Hemmings saw him beat two blue shirts before finding Rowe in space. Rowe played the ball to Philliskirk, who played a lovely chipped ball over the top for Jim Kellermann and his half-volley from 15 yards was well saved by Graham Stack. Two minutes later the Coasters went close again. This time a headed clearance from a throw fell to Cardle on the edge of the box and his low effort was deflected just wide of the right post. Hemmings was next to try his luck when a throw was headed into his path. With his back to goal he tried an audacious overhead kick but his effort looped just over the bar and on to the roof of the net. Making his return to the side, winger Cardle looked a threat all afternoon, with his whipped crosses continuously causing the hosts problems. After switching to the right he produced two excellent crosses in quick succession which narrowly missed first Hemmings and then Rowe. Eastleigh started the second half brighter and on 53 minutes had one of the best chances of the game. A deep cross from the right was headed into the box by Paul McCallum but the unmarked Cav Miley could only fire the ball well over from 12 yards. Sixty seconds later Fylde almost unlocked the home defence. Another cross from the right by Cardle was controlled by Philliskirk 12 yards out but his shot and Croasdale’s follow-up were both blocked. Back came the hosts as Yeates exploited space down the right before cutting in and seeing his effort deflected over by the outstretched leg of Jordan Tunnicliffe. Substitute Gime Toure again proved effective off the bench and he used his pace and power to beat Reda Johnson but his cross was cleared. The final chance of the game came from a Fylde corner which was played short to Danny Rowe, who fired just over the bar from the edge of the box. The final whistle blew shortly after and despite the clean sheet the Coasters had to settle for a point which leaves them seventh in the table.